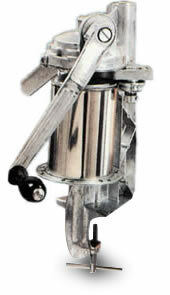 Manual and electric can sealers are available for sealing the open top cans. Sealers are available for 4 oz. cans through 105 oz. cans. Hand powered sealers must be firmly clamped or bolted to a sturdy table or bench (clamp included). Additional chucks/spacers may be purchased. Please contact us for futher information. Sealers are made to order- typical lead time is approximately 10 business days. Instruction manuals included with all sealers. PLEASE NOTE: Can sealers are not returnable.